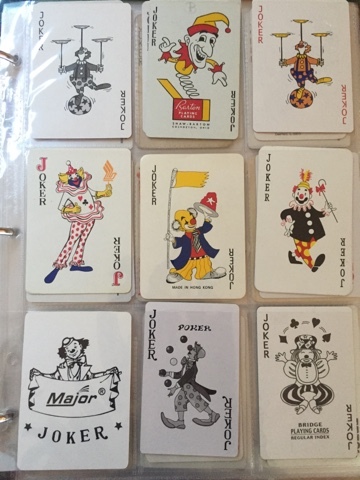 I have a section in my collection with clown jokers. Can I be honest? I don't really like clown jokers. 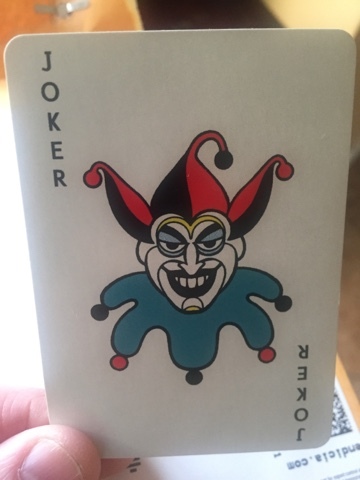 I think jokers should have jesters on them. I think clowns are a mistake, a poor substitute. With that said, I thought I would share a few of the more interesting clown jokers with you. Clowns & Jokers Together: Why? Here's an update on the joker collection. Oct 12, 2018. And for your pleasure, it's a video of the clown jokers. 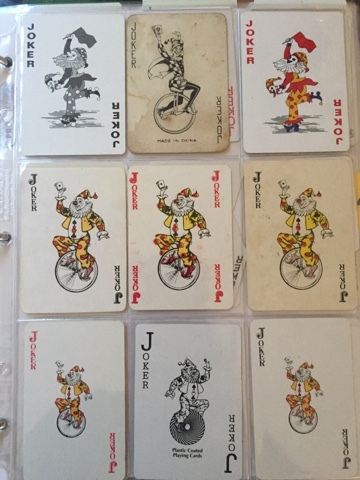 Below are all the pages as of today in the clown section of the joker collection. I count 87 different jokers. 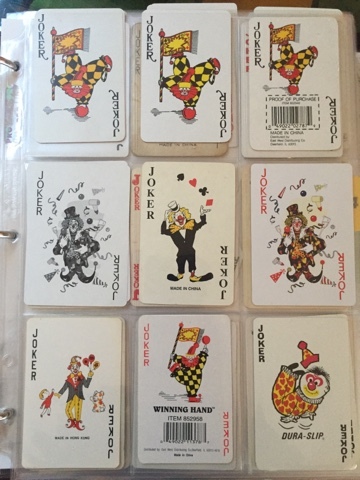 There are four pages with nine jokers plus five on the next page. The pages have a minor themes. For instance, the first one below is mostly clowns juggling, balancing, or generally performing. The jokers on the next page are pretty common. Common enough so he has a name: Clowny! There's the standard Clowny and some variations including Clowny on black. 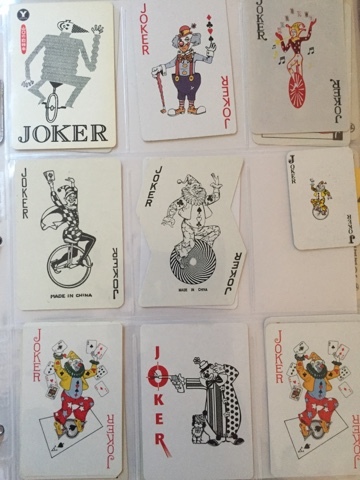 This set of jokers has more of a bicycling theme and since they are clowns, it's more a cycling theme with most of them on unicycles. It might not surprise you to know that I have a unicycle in the garage but I cannot balance on it. However, I am a good juggler. (see me juggling). This last shot is a jester, a spooky jester face. I included him so you can see that a jester wears a jester hat. Jokers have pointed or roundish clown hats. The distinction is usually pretty clear. This article was updated Sept 21, 2017. As part of that, I updated my clown joker count from 45 to 87. I've been working hard this summer to grow and improve my collection. Astute observers will notice that I also improved my photography although I still feel that I have a lot of need to improve.